Chrysler says 2019 Jeep Cherokees may not provide warning chimes, messages and gauges. 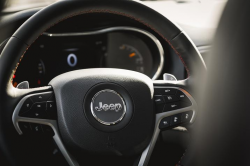 March 7, 2019 — Chrysler is recalling 52 model year 2019 Jeep Cherokees with instrument clusters that may not provide warning chimes, messages and gauges. The new Jeeps will need new instrument clusters installed by dealers. The recall is underway, but Jeep Cherokee owners with questions may call 800-853-1403. Chrysler's number for this recall is UC4. CarComplaints.com has owner-reported complaints about Jeep Cherokees.